Son of My Right Hand. …although, I'm left-handed. As someone who knows folks married to or friends with cops, it’s frustrating to see the defensiveness about speaking about Ferguson. If you know a good cop, THAT IS AWESOME. There are TONS of them. That does not mean that what is happening in Black America is not real, or that racism is dead. It is OK to hate the system that makes black people more likely to be shot by cops while appreciating the good things that so many of our police do every day to keep people safe. Most cops are doing good work, and the failure of the system in Ferguson is an insult to THEM. Railing against police brutality is not an indictment against all police officers, just as railing against sexism is not an indictment of all men. I’d like to think we’re all just trying to do good, and right by our families, friends, and fellow humans, and we should all be trying to break down the system that causes us to unconsciously treat others differently. I’m a white suburban man, I’m (as John Scalzi says) running the game of life on the “easy setting”, and that’s why I feel it’s even more important for people like me to speak out and say we stand against failures like this. Darren Wilson was not on trial. The grand jury’s only job was to determine if it was worth having a trial, and the conflicting reports make it pretty damn obvious there should have been one. I don’t know if Darren Wilson did everything right or everything wrong. I don’t know if Mike Brown was a perfect human being or a “thug.” Neither does any of us. The decision last night means that the evidence won’t even be evaluated in a proper trial, and the release of the complete transcripts means the evidence has been exposed and has tainted almost anything that could be done about it in the future. Yes, yes, I know the commercials are kind of annoying, but I think I’d never actually seen one of them before I’d visited Jared for the first time. Cynthia had gotten jewelry at Jared (The Galleria of Jewelry!) in the past, and been happy with them, so that’s where I went. I got Cynthia some jewelry at Jared as a gift. They were friendly, and helpful, and I gave no more thought to it beyond that. Then, last year, Cynthia lost the jewelry. It was just an accident, these things happen. I’ve certainly lost my share of things and I know how frustrating it is. I felt bad for Cynthia feeling bad more than I was bothered that she lost something I got her. Regardless, it is always heartbreaking to lose something with sentimental value. Jared: We’re showing that item as having been discontinued. It shows in our system as being recalled and returned to the vendor [that made them for Jared]. Me: Ah, well OK, so at least maybe they still exist, can you contact the vendor and see if it’s possible to still get one from them? Jared: No, I’m sorry, if they’re marked as being recalled, we can’t do that. Me: Oh well, can you at least let me know the vendor and I’ll see if I can work something out with them? I can certainly get other jewelry for my wife, but I’d like an exact replacement, if possible. Jared: I’m sorry, it’s our policy to not disclose our vendors to customers. Me: I see, so there’s no way for me to get a replacement, even though it’s reasonable to assume that one exists somewhere? Jared: I’m sorry, I can’t help you. Grargh! That’s a stupid policy. I tried calling a couple times, and tried going up the chain to managers, but didn’t have any luck. I can understand, as a middle-man, not wanting to give away business, but this was ridiculous. So, that was frustrating, but well, it’s their policy, there’s nothing I could do about it. It’s a stupid way to treat a customer, but it’s their right. Dennis: So I know it shows as recalled, but I do actually see 1 left among all our stores. Usually this is just because someone didn’t update inventory right, but I called the store, and they actually have it! Now, in Customer Care we can’t initiate a transfer ourselves, the stores have to request it. But, they are going to do so and have it sent to your local Jared in Cary. Since the holidays are coming up, they may get a little slammed, try giving them a call next week to see if they got the transfer request, and they should let you know when it comes in. I let it sit over the weekend, and called the local Jared the next week. They said they didn’t have the item in yet, but they would contact me as soon as it did. They reiterated what Dennis said, that during the holidays things get pretty busy, but transfers usually come through in a week or two, often sooner. Jared: Oh, that? Uhh… It got here on December 16th, and sat here since then. We got a request two days ago that it was needed for a customer service issue in Florida and sent it to them. We don’t have it anymore. You (customer care and Cary Jared) assured me it had my name on it, and that you’d contact me as soon as it’s there. WHAT THE F**K!? Needless to say, I was pretty much speechless. I pushed them for more details, but they didn’t really have more. The guy I spoke to was a salesperson, not the one who deals with transfers, so he didn’t know much. He did say he would try to find a photo of it and see if he could find the same thing in their special order catalogs, since sometimes they’ll get a different vendor to make the same items. I still had Dennis’s extension, so I hung up with the local Jared and called him instead. His demeanor was entirely different this time around, much more like the first time I talked to Jared customer care. He told me it was too late, that the item was “lost,” and that there wasn’t anything he could do about it. He said they may be able to make it as a custom item, or if I wanted to go to the store and flip through their catalogs for special orders (ie, what the guy at Jared Cary was doing for me), there might be a match there. In other words, if I want a replacement, I can have one custom made. You, YES YOU, Can Shave My Moustache! As you may or may not know, I’ve been participating in Movember. You may not know, because I’ve been pretty slack about “marketing” my lip-caterpillar. So, like a kid who does his homework on the bus on the way to school, I’m gonna DOUBLE DOWN and try to get all those juicy donations on the last day of Movember. Here’s my proposal: If you are the top contributor to my Movember page, I will shave my moustache tomorrow however you tell me to. Options are limited to what I can perform with my pretty sweet facial hair trimmer system thingy. You must be the top donator. If there is a tie, the first person to donate that amount wins. I will notify you tomorrow by 3PM EST if you have won. I will post pictures by Friday morning. So GO TO MY MOVEMBER PAGE NOW and bid, and help raise money for cancer research! Note: this is all my personal opinion. I have no special insight into the team other that being a fan that has learned a lot about hockey in the 5 years he’s been watching it, and has watched this Hurricanes team closely in that time. Cynthia and I have talked about this stuff a lot on our own, but generally have attempted to avoid the craziness bouncing around the net where it comes to Maurice leaving. I think that when a lot of our veterans rolled off the roster, we ended up with a lack of mentors. Now, I am definitely not saying that Staal is unable to be captain, or unable to lead. Only that we had a lot of even-keeled veterans on our team, and we don’t have as much of that anymore. Many of our most “veteran” players are really players that should only be coming into their prime now: Ward, Staal, even Harrison and Pitkanen. Notice anything about that list? Harrison is 29, just getting into what should be his best years as a d-man. Ward is 27. Staal is 27. Pitkanen is 28. They’re good players, and they’ve seen their fair share, but they’re not yet at the place that someone like Brind’amour was at, or Wesley. I think about my job, and how as we slowly grow, our senior architect is giving me the occasional project to run, rather than just working with me on requirements, or letting me just run with whatever takes my fancy. Someday, the guys who started the company are going to want to retire, and I’m gonna be the one who is less responsible for coding, and more responsible for organizing the junior developers, and frankly, that’s a little scary. I like coding, and I don’t really like managing people. But I know that someone has to do it, and when it comes to it, I’ll give it a shot because I like the folks I work with, and I want our company to succeed. If you can’t grow in what you do, you stagnate. So Who’s Gonna Be That Guy? Is it crazy to think that not enough people on the team have stepped in to be that guy willing to take on a little more responsibility? To make sure a few of the young guys are getting the attention they need to feel like they’re an important part of the organization? It’s not enough to score goals and feel good about that — the opinions of your peer group, and the collaboration that goes on in a team that works well together matters just as much as your skill. It’s not enough to make Staal, Sutter, and Gleason bear the brunt of that as captains. Hockey relies so much on nuance, and atitude, and the little things that make that tiny push over the edge which makes you better than the other team. If you’re at the NHL level, you already have the skills. What keeps you going is your ability to be motivated a bit more than the guys on the other team, and to make sure your teammates are with you on it. In a good team, everyone steps in to help out those around him. When something’s not working, it’s not just the coach, or the captain, or the assistant captains, or that one guy in a scoring slump, or even one system or the other. All of those things have to interact together, and be working, for the team to be above .500 and have a chance at the playoffs. Could Maurice have been too stuck in his style to be able to find a way to get the players motivated? Maybe a little. Do I think Maurice was the problem? Not really. Or, that is to say, not any more than anyone else. I feel like as a team that can’t afford to spend to the cap, we’re less likely to have a large number of veterans filling our roster, so we have to work harder to have that baseline that keeps a team motivated. Bringing in a new coach doesn’t automatically make players better team leaders, but rethinking everything may help our players rethink what we really need to be successful. I feel bad for Maurice having to go through getting kicked out a second time, but he’s a good guy and I’m confident he can land on his feet. I’ll miss his post-game interview snark, and his easy manner, but I’m also hopeful for the future, and looking forward to what Muller will bring. My impressions so far are that he’s solid, and will focus on the right things. EDIT: I mentioned this on Twitter; a good example of the mentorship I’m talking about is… (hmm) Erik Cole with Jeff Skinner last year. Everyone talked about how he took Skinner under his wing and really helped him get comfortable in the NHL. Starbucks is the gateway drug. Is it good coffee? Not really. But oh man, it is candy. I still enjoy a Starbucks mocha, but I don’t pretend it’s the same thing as a proper Italian espresso, or a nice Turkish coffee. Starbucks is more like Taco Bell. I don’t delude myself that it’s Mexican food, but sometimes I crave it all the same. In the last few years I’ve been lucky enough to travel to a lot of interesting places. having come to the Starbucks-driven conclusion that maybe I would like some kinds of coffee, I had started trying coffee when I visited other countries. Cynthia and I went to Brazil with a friend and the coffee in our hotel was spectacular. Sweet and a little bit chocolaty and not at all bitter. I was visiting Germany for the OpenNMS User Conference and a coworker and I would get latte macchiatos and they were great as well — silky smooth. In Spain I tried a caffè macchiato and it was tasty too, like a good dark chocolate. In Italy, we tried caffe con panna, a wonderful mix of espresso and sweet whipped cream. A great little deli right here in Fuquay-Varina of all places, Nil’s, makes wonderful Turkish coffee, thick and sweet. Since getting acclimated to coffees I like, I’ve tried drip coffees thinking “Coffee is an acquired taste, right? Maybe I’m just used to it now.” Nope, still not in the same universe as what I make at home now, much less the wide variety of wonderful coffees I’ve just mentioned. Making it myself is not only better, but it’s extremely consistent. It’s hard to make a bad cup if you’ve got good beans. So let me start out by saying, I am still in no way an expert. I can only say what I’ve found that I like, in my quest for coffee that fits my tastes. First, the average espresso machine in Europe is better maintained than here in the US. There are certainly plenty of good coffee shops in America with people painstakingly crafting good coffee, but for every one of those, there are 5 with poorly-maintained equipment, or a barista who doesn’t know the craft as well. When I was traveling, though, I found that I could walk into any random place with coffee and it was well-made. Second, European roasters tend to not roast their beans as dark as US roasters do. This turned out to be the real key. With that knowledge in hand, I looked into what it would take to make my own coffee. First, how do I brew? To make a proper brew without your own espresso machine, the consensus I’ve found is to use either a classic French press or a new contender on the block, the AeroPress. 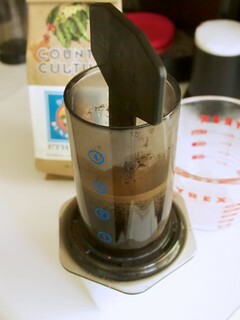 The AeroPress has the advantage that it’s super cheap, and makes a very smooth cup of coffee. Score. Second, what do I brew? Probably my favorite coffees I’ve had were the Brazilian cafezinho, and the espresso we had in Italy. The first thing I found was Counter Culture’s Toscano, a Tuscan espresso roast very much like what we had in Italy. Cynthia got me the AeroPress and some beans and I was in business. The Toscano turned out to be pretty darn good. Really smooth and good flavor, not bitter at all. Since I got that first bag of beans, a new coffee shop has opened up in Pittsboro (where I work) – Red Star Coffee. They do a really good job of making espresso, and they get their beans from Bean Traders, who roast a wide variety of excellent beans, and, like Counter Culture, are local. Even better, they have a Brazilian roast, and it’s heavenly. Finding fresh, good beans that haven’t been burned to Hell has definitely been the most important part of this. Nothing groundbreaking. Just a taste for something I thought I had no taste for. I hope you enjoyed my journey into coffee love. I have a problem. I am physically incapable of scanning past certain types of comments on certain SBNation sites. I really hate to lose the 99.9% of comments that are awesome just because of my inability to look past the 0.1% that frustrate me, and I hate myself more for responding to those people when I should know better. It’s non-destructive (if you remove someone from the black list, they’ll pop right back in the display), and I was careful to make it as high-performance as possible. It runs entirely in your browser session, and does not touch anything other than the display of the site as you see it. The official page for it is here. It’s Hockey Time! Can’t you hear it? While there was technically one “home” game in Helsinki, tonight is the night for a real home game! On game days, we usually play our “hockey” playlist, which is made up of all the songs I’ve managed to capture with Shazam on my iPhone. A few folks have asked for our list so far, so… here it is! If you know of anything I’ve missed, please let me know, and I’ll add it. * Does anyone know who does this cover? I couldn’t find it anywhere. I’ve been planning on writing for quite some time now about our time in Helsinki. Needless to say, it was freakin’ awesome! We had a wonderful time hanging out with the other Caniacs on the trip, having lunch with the team, meeting some Finnish friends, and, of course, winning both games! Someday I’ll put together a full report. In the meantime, I finally had some time to start working on a proper site for Jussi4ASG. When we get it filled out a little more, I’ll post the design. It’s hard to look at Twitter or FaceBook without being reminded of the events of 9/11, and their impact on our society. It is, of course, honorable and important to remember those who have fallen, and to respect those who were and are heroes from that day and now, but it’s hard to look at all those “never forget!” messages without feeling a little conflicted. The frustrating thing is that we have forgotten. There are so many things we have forgotten since 9/11, it’s hard to believe just how much has changed in 9 short years. We have forgotten the freedom to live our lives without fear of wiretapping without just cause. We have forgotten the fourth amendment to the Constitution (unless you’re rich). We have forgotten that no matter the ends, it does not justify the means. We have forgotten basic human dignity (and common sense). Who is complicit in these things? I know I am. What have I done so far to change it? I elected a President whose rhetoric convinced me he could change things, and instead has perpetuated the policies that took these freedoms away in the name of security, while pretended to make things better and while leaving thousands of “non-combat” troops and contractors in the area. I guess perhaps it’s time I stop saying never forget, and start saying, now I remember.